This baking done was out of hunger and procrastination (I am very good at that). I had store bought puff pastry in my freezer because I attempted to make napoleons (mille-feuille) once, that was an arduous task, and if I ever made it again I would use it. But instead of making napoleons I made an Asparagus and dill quiche and apple galette since the package came with two puff pastry sheets. When I unfolded the puff pastries I felt that it was not big enough to use, therefore I rolled it out a bit. As I was baking I listened to Michael Bublé’s new album, To be loved, to calm my brain down from all the studying. It’s a great album and I love his music. 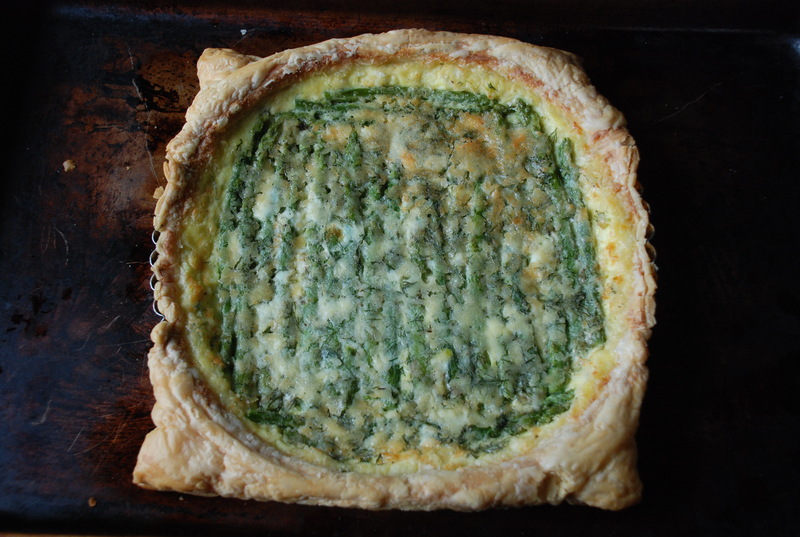 In the original recipe, a rectangular tart pan is used but I have a circular one and I felt that it’s not much of a tart but more of a quiche since it has cheese, milk and eggs. Also, I did not have buttermilk so I decided to make my own, which is the yellow/white mixture in the bowl. That was not a good idea, I knew it too but I still had to try it, because after you bake it all those lumpy bits, which you see in one photo, melts into a big puddle of butter atop the quiche. I had to use coffee filters to soak up all that butter. Well I learned my lesson, buy buttermilk or use the milk you have already. Another store bought product, as you can tell, is frozen asparagus. No need to boil it just defrost it and use it. The weird buttermilk mixture I attempted to make. After I soaked out all the butter. Roll the dough into an 11-inch disk (for a 9-inch round pan) or a 16″ x 6″ rectangle (for a rectangular pan) and fit it carefully into the pan, leaving the overhang in place for now. Prick the dough with a fork, then stick in the fridge for half an hour or so to rest (this ensures that the dough won’t shrink when baked. 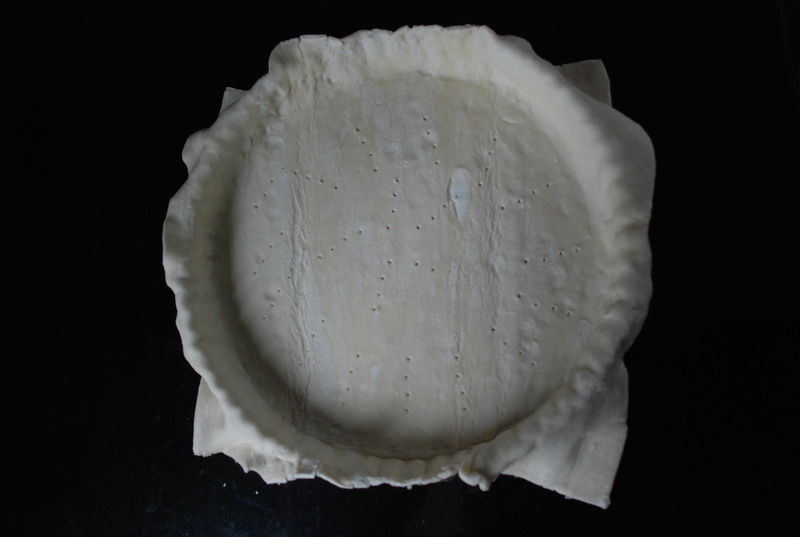 The overhang helps with this, too; I cut it off after the tart was done.) Meanwhile, preheat the oven to 400°F. 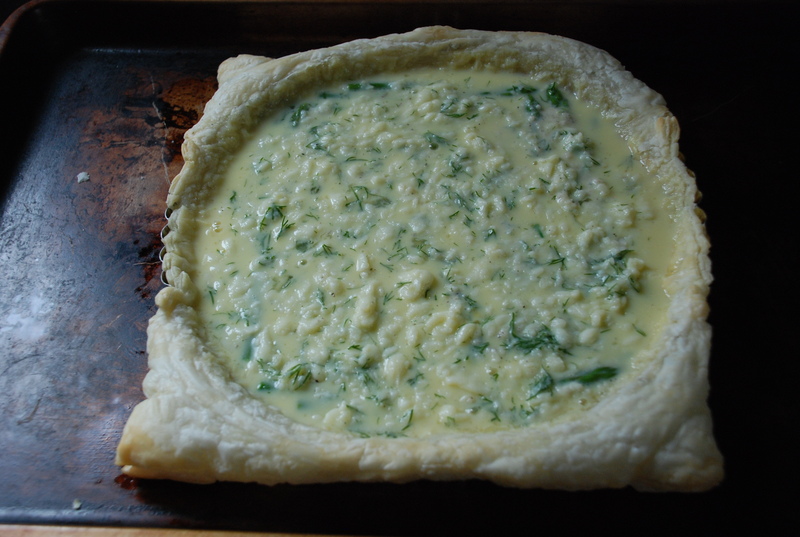 Put crust on a flat baking sheet and blind bake the crust for 15 minutes, then reduce the oven temperature to 350°F. Leave the tart on the baking sheet. Bring a large pot of water to a boil, then drop in asparagus and cook just until tender, about 5 minutes. (Slater says longer, but I can’t bare to overcook a batch of perfect ‘gus.) 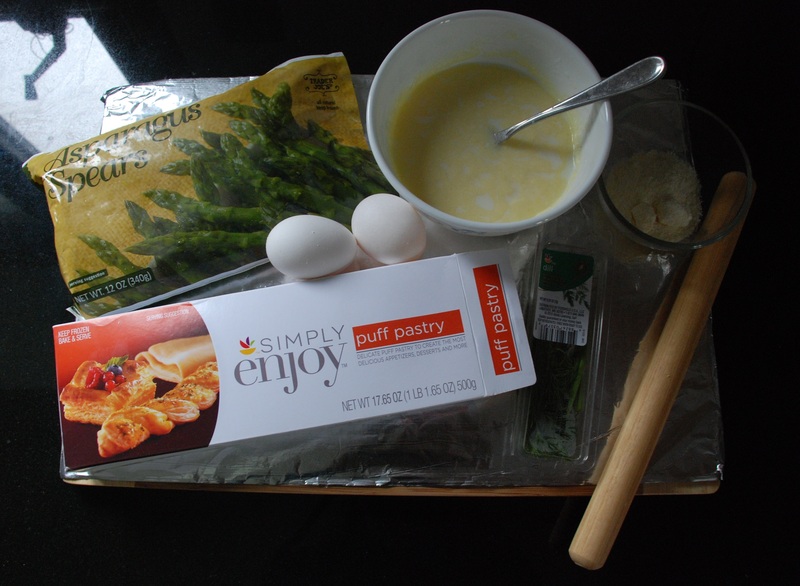 Remove the asparagus and set aside. I was going to try to make this out of memory from the apple pies I’ve made but I thought I better refer to a recipe just to make sure. I did not want to save the puff pastry for another time, besides I had extra apples that I cut up from the French apple tart. To make the filling, in a large bowl, stir together the apples, sugar, lemon juice, cinnamon, nutmeg, salt and cornstarch. Set aside. 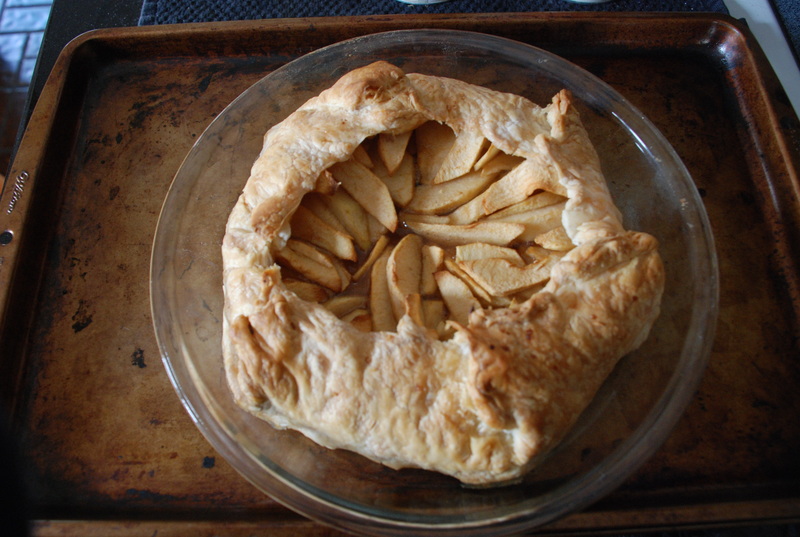 Roll the puff pastry to a bit to accommodate the amount of apples you will be putting in. About 12-inch round. Brush off the excess flour. Transfer the dough to the prepared baking sheet, cover with plastic wrap and refrigerate for 30 minutes. 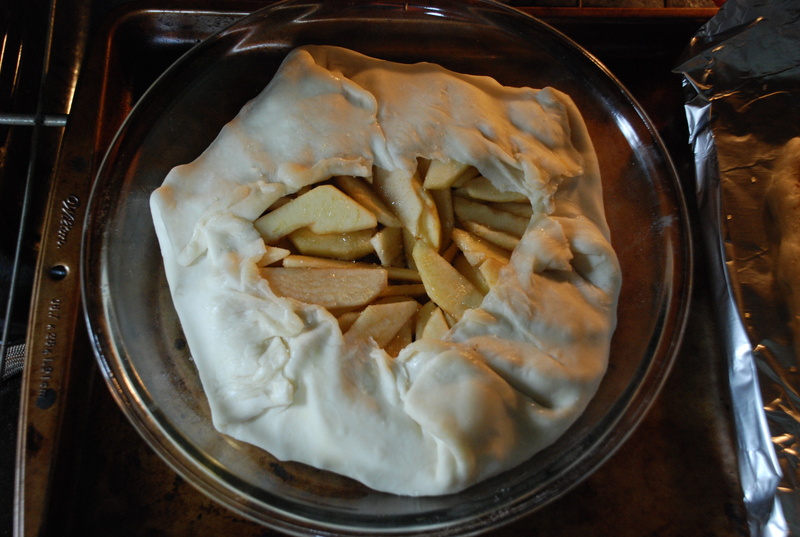 Arrange the apple filling in the center of the dough, mounding the fruit slightly and leaving a 2-inch border. 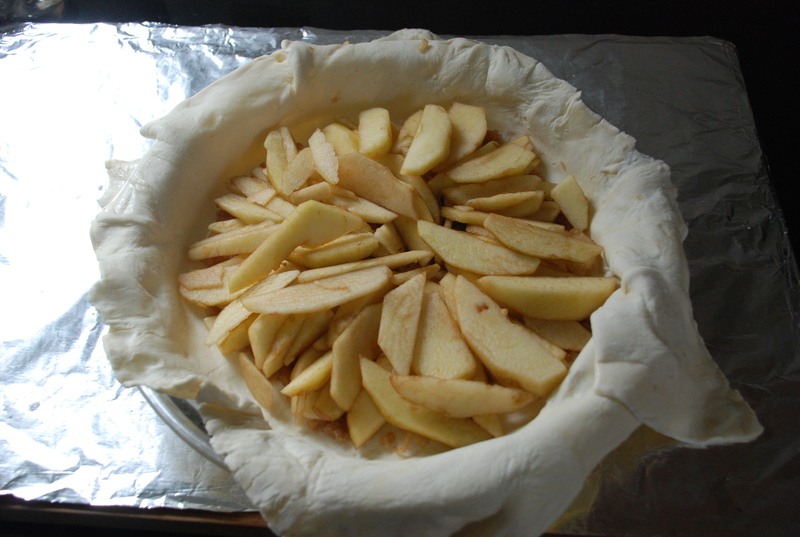 Gently fold the edges of the dough over the apples, pleating loosely. Lightly sprinkle sugar over the apples. Bake until the crust is golden and the apples are tender, about 1 hour. Transfer the pan to a wire rack and let the galette cool completely, about 1 hour.